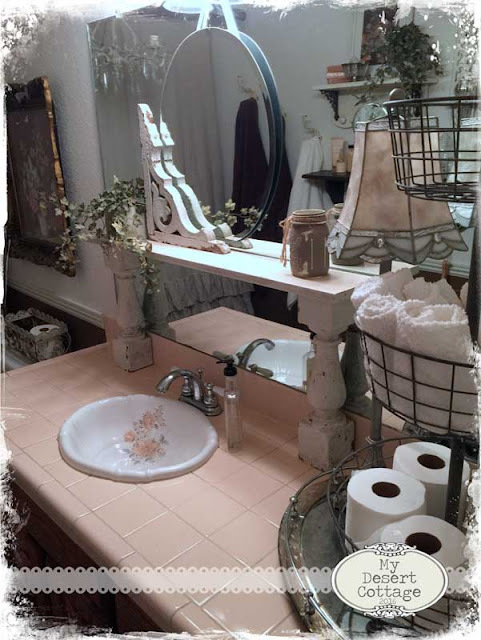 **My Desert Cottage**: How my $5.00 Thrift store find cost me $150.00!!! If you know me, you know that I love to go junkin. It doesn't matter if it's a thrift store, a garage or estate sale, or an awesome flea market. I am a junkin junky! I brought it home, washed it and hung it. Heavenly. That is the only word I could use. There was only one problem... The wall color. I wish I had a "before "pic to show you. The walls werent terrible, they just werent "me". You see, we have this peach tile all over the bathroom. When it was my sons bathroom, we did everything we could to counter balance all the peach. We settled on blue because there is a tiny bit of blue in the design in the sink. After my son moved out I decided not to fight the color anymore and painted the walls a peach color thinking that if I just embraced the color, I would grow to love it... NOT! So the shower curtain was the catalyst to finally paint the walls again and go back to one of my never fail and beloved whites. The beige color of the shower curtain actually looks really pretty with the peach tile. I love this room now. It doesn't get used much except as a guest bathroom, but I see it every time I walk down the hallway. You see.... I loved that hall bathroom so much I decided to redo my master bathroom, which I have hated since we moved into our home almost 20 years ago! It is tiny and has a very ugly step down shower in it. What was necessary for me to love this room too?? You got it... another Pottery Barn shower curtain. Unfortunately, this one was NOT $5.00!!! Once again I tried to embrace the color of the tile that I was stuck with and went with a creamy yellow, grey and white color scheme. It actually matched my bedroom quite nicely! 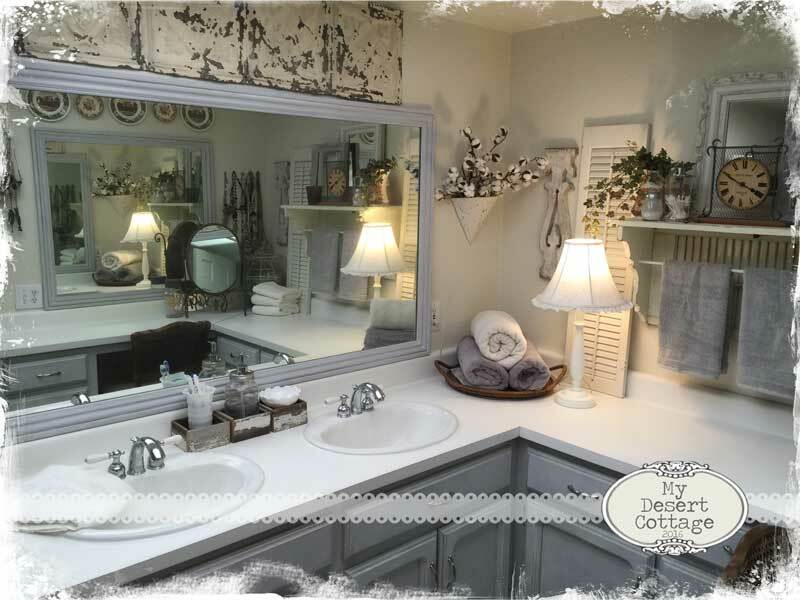 In addition to the new curtain, I painted the wood cabinets and added door casing around the mirror. And of course... I have to add pretty vintage details and architectural salvage to every room in the house! I am beyond thrilled with the results and still get a smile on my face when I walk into either room! Both bathrooms are lovely, you did a great job! I painted my sun room walls peach one-time. After all was said and done, all I could see was BARBIE skin!Peach is one of those "tricky" colors for me. Love the changes in both bathrooms!! You had a case of the "Might as Well's"! Or like I say whenever we start a project...the Snow Ball Effect...it just keeps getting bigger and more expensive like a snow ball rolling down a hill!! LOL!! Great results!! and what really matters is that you are happy with it!! You are so lucky that your tile is a tolerable color. My master bath has the most awful mauve countertops, hideous!! I painted the walls taupe and put up burgundy accents to try to fool myself into thinking it isn't really mauve. It is too expensive to replace since it isn't damaged, but I often think of taking a hammer to it so I could justify getting rid of it! 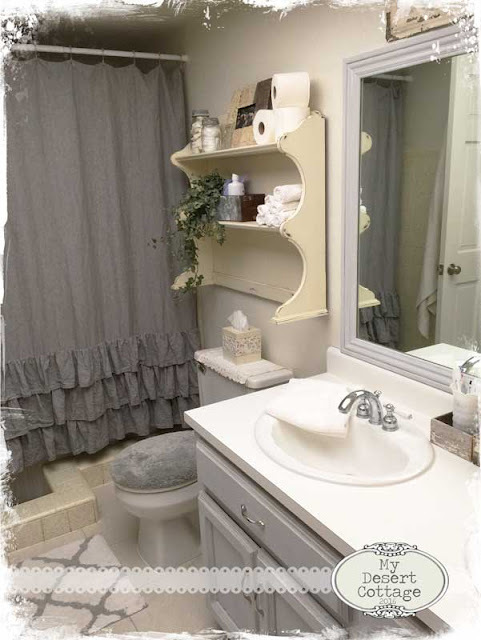 Word to anyone redoing a bathroom, neutrals! 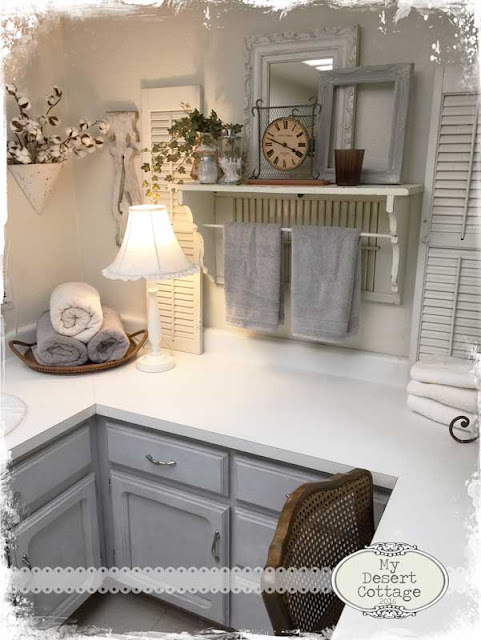 I don't think countertops and sinks and toilets and tubs should even be available in mauve, or blue, or anything other than whites, creams, browns and tans. Isn't that the way it goes, paint the walls, ceilings needs painting and flooring looks bad then, lol. We're so "lucky" we have cottage cheese ceilings, NOT. We do live out in rural area few miles west of Grand Junction on half acre so we can have chickens. We also have fantastic views and quiet. Your shower curtain was wonderful bargain until you started changing things. One thing always seems to lead to another. Love the ruffles and fabric look of it. Your master bath is really nice. Can paint counter tops. Are we ever really happy with what we "inherit" in a home? Nope not me. We have single wide mfg. home 16x80. The size is ok but previous owners tastes were definitely not mine. All walls have vinyl like patterned wallpaper on them, UGH! and the carpet, that high low cheapy ugh stuff. Would rather have lino floors which are under carpets, all gagacious colors. Can put area rugs down. Hubs won't let me pull up carpets tho. Only want to pull up living room and our room. Absolutely beautiful!! I love them both!!! Karen, it's just so lovely what you have done with your bathrooms. Such gentle colours and detailing.Must be a delight where once was an annoyance.Thanks for sharing. L O V E your $4.99 Shower Curtain "find", dear friend! 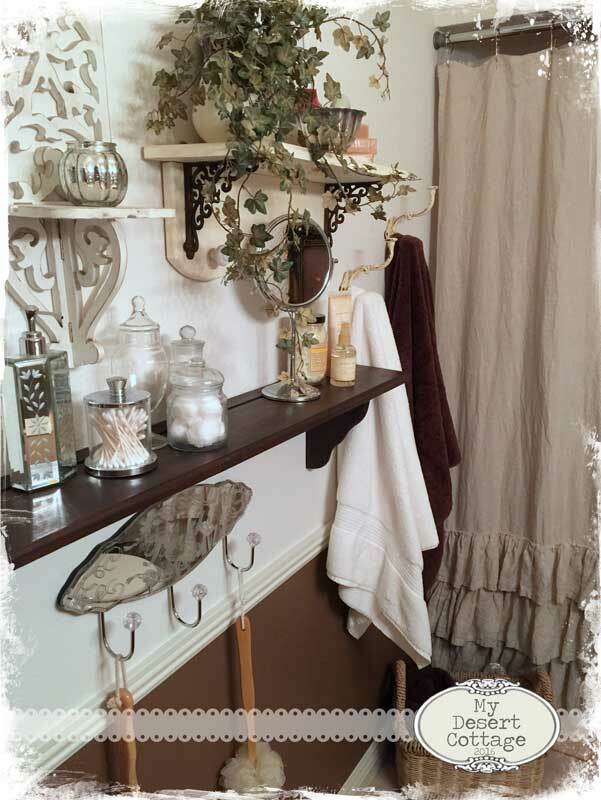 The new paint and accessories make your Master Bath transformation absolutely gorgeous! As they say, one improvement leads to another. Love the shower curtains! I have a chenille shower curtain in one of our guest bathrooms that I got for half price and everyone that sees it comments on it. I would love to see your home, it seems to be so warm and inviting. 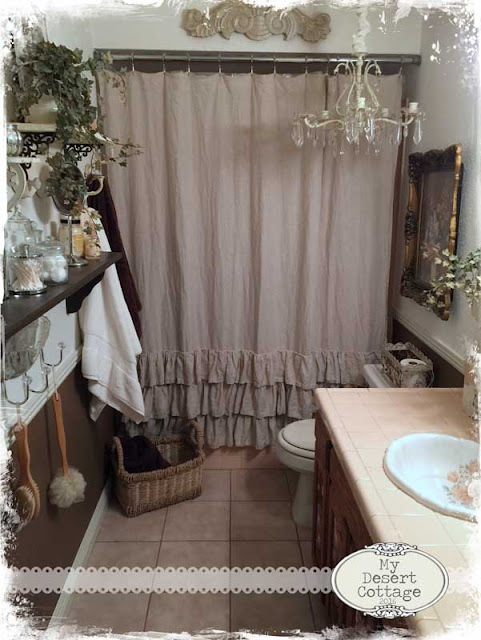 I think that shower curtain + the $150.00 did you a favor as both rooms are gorgeous now. Sometimes we shouldn't share the before pics, lol. This post made me laugh!! I have a $12 table on my patio that cost $300 by the time I was finished with it - haha! Your end result is lovely. It's those little finds that sometimes get us stimulated to get on with what we had been wanting to do and hadn't! Both baths do look GREAT! oh Karen LOL...well atleast you are good to go for a long while! Looks great! I always love your energy. Fun bathroom, love grey. Thanks for the visit. room gets redone to go with it!!!! I love your ruffled shower curtains, and your transformations! I love those shower curtains. What a great find. Your makeovers are amazing. So many cute details. I need those in my life! You always put together such a great manner!! Hi my name is Rebecca and I am a junkin junky. Amazing score! I have found some nice linens at my local thrift store and your find looks wonderful in you bathroom and for $5 wow! We have been in our home for 6 years now and I have three bathrooms and only been able to remodel one. We do what we can when we can right? Love your blog and look forward to your next post. just gorgeous!what a great find..even if it was a little pricey, it was totally worth it! OMG... what a wonderful bathroom. I completely understand how one tiny inspiration piece that was not expensive can end up having one spend a fortune they did not plan on. Been there, done that. The trim on the bathroom mirror is what i notice first. It just makes the room. The re purposed shutters look great and the ceiling tin is beyond amazing. So many beautiful elements. Both bathrooms look really nice.